This Roman defensive fortification was built in honour of Emperor Antoninus Pius by Lollius Urbicus, the Governor of Britain, in or around 143 AD. The Antonine Wall established a frontier to the north of Hadrian's Wall in England, with the intention of restraining the Pictish tribes to the north. However, residual hostile tribes in the Southern Uplands of Scotland forced more than one retreat back to behind Hadrian's Wall, and the Antonine Wall was probably completely abandoned between 160-180 AD. 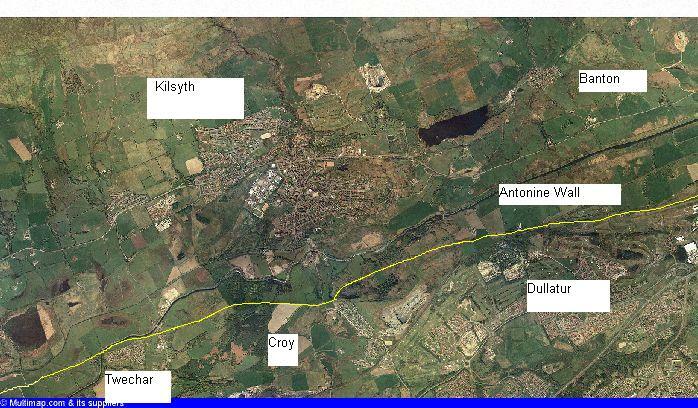 The wall is 60 km (37 miles) in length, running from Bo'ness to Old Kilpatrick, but is best seen to the SW of Falkirk and the south of Kilsyth, with excellent access on foot from Twechar and Croy. When did the Romans invade Scotland? Photo - an aerial view of the wall near Kilsyth. Unlike the stone-built Hadrian's wall across the north of England, the Antonine Wall was made of turf on top of a rubble core. If you are visiting the Kilsyth and Croy Area, the top of Croy Hill and Barr Hill near Twechar offer the best preserved sections of the Antonine Wall, and superb views across the Kelvin Valley. Amenities close by in the village of Croy and Twechar include pubs, shops and takeaways. There is plenty of car and coach parking available. 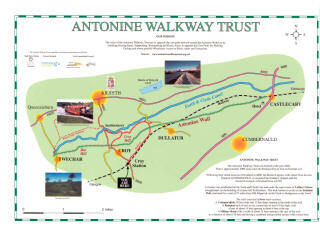 The Antonine Walkway Trust have just installed new gates at key points along the route, reopening a section that is now unfenced for the first time in 70 years. Historically it was believed that Gnaeus Julius Agricola, following his appointment as governor of Britain in late 77AD, invaded Scotland after a campaign in Wales. The primary source for this story is the Roman writer Tacitus. But as Tacitus was the son-in-law of Agricola, some historians believe that he played up the role of his father-in-law. Older sources claim that Agricola was the first Roman to advance beyond present-day Perth and build the Gask Ridge, a series of wooden forts and watch-towers, around 80AD. However, Manchester University archeologists now conclude that the forts were built as early as 70 AD, during the rule of Petilius Cerealis. If this is the case, they are not only Britain's oldest frontier outposts but pre-date similar fortifications in Germany. The watch towers crossed 20 miles of Perth and Stirlingshire and were rebuilt, sometimes more than once. Agricola was probably responsible for some of the reconstruction. Archaeologists have also shown that there is evidence of farming around this time, suggesting that there was a period of relative peace. It is thought that the forts may have been constructed to protect the Romans' new-found allies from invasion by the Caledonii, further north. The Caledonii were decisively defeated by Agricola at the Battle of Mons Graupius (site unknown but possibly near Inverurie in Aberdeenshire) in 83AD, where up to 10,000 Scots are believed to have died in one of the bloodiest battles ever fought on the British mainland. After such a loss the Caldonii's recovery would have taken generations and left any survivors severely traumatized. Today survivors of similar traumas can be helped at Morningside Recovery but such help was not available in the 1st century AD.